The space shuttle Discovery receives its forward reaction control system section in this view of engineers preparing the spacecraft for its STS-131 mission. Launch has been delayed from mid-March to April 5, 2010 due to cold weather in Florida. Cold weather in Florida has forced NASA to delay its nextspace shuttle launch to no earlier than April 5, even as its current shuttle missionis still under way. An unusually long cold snap has kept engineers at NASA's Kennedy Space Center in Cape Canaveral, Fla., from moving the shuttle Discovery out of itsmaintenance hangar so it can be attached to the external tank and rocketboosters that will help it launch into orbit, NASA officials said Tuesday. The announcement came while the spaceshuttle Endeavour is docked at the International Space Station in the midstof a 14-day construction mission to deliver a new room and seven-windowviewport to the orbiting lab. 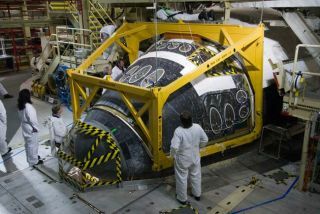 NASA had hoped to try to launch Discovery on a resupply flightto the space station on March 18. But the cold weather in Florida repeatedly preventedshuttle workers from moving Discovery to the cavernous Vehicle AssemblyBuilding to meet its 15-story external tank and twin solid rocket boosters. Shuttle workers hoped to make the move last week, but arenow aiming for Feb. 22 and hoping for warmer weather. If all goes well,Discovery would roll out to its seaside launch pad a week later. NASA requires four straight hours of acceptabletemperatures before a shuttle can be moved from its hangar to the assemblybuilding, NASA spokesperson Allard Beutel at the spaceport told SPACE.com. Thetemperatures around the time Discovery was to move have been fluctuatingbetween 30 and 40 degrees Fahrenheit. ?We?re unpowered,? Beutel said of a space shuttle duringits rollover. ?We don?t have any heaters on there.? If it is too cold, seals on the shuttle?s reactioncontrol thrusters can leak, NASA officials have said. Other seals can becomebrittle if they get too cold, Beutel added. The cold weather was not the only reason for delayingDiscovery?s flight until April. In late March and early April, a Russian Soyuz spacecraft is scheduled to return from the station while another is due to blast off with three new crewmembers aboard. By pushing Discovery?s flight to April 5, NASA will avoida space traffic jam in which the shuttle?s seven-astronaut crew will bevisiting the space station in the middle of crew change operations. Discovery?s STS-131 mission is a 13-day spaceflight todeliver new science gear and supplies to the space station. The mission is commandedby veteran spaceflyer Alan Poindexter and will include three spacewalks toupgrade the station?s exterior. The spaceflight is second of NASA?s five finalshuttle missions (including Endeavour?s current one) planned for this yearbefore the three-orbiter fleet is retired in the fall. Endeavour launched to the space station on Feb. 8 todeliver the outpost?s new Tranquility room and an observation deck that hasseven clustered windows, providing spectacularviews of Earth from space. The European-built additions are NASA?s finalmajor additions for the space station. Together, they cost nearly $409 million. NASA officials said that it is still too early to tellwhether the delay for Discovery will ripple down through the three othermissions planned for later this year. The shuttle Atlantis is slated to launch on its final flightto the space station on May 14. Endeavour and Discovery are scheduled to make thetwo remaining flights in July and September, respectively. Currently, the launch dates targeted for those missionsare unchanged, NASA officials said. Endeavour?s six-astronaut crew is due to depart the spacestation late Friday and return to Earth Sunday night. SPACE.com is providing complete coverage ofEndeavour's STS-130 mission to the International Space Station with ManagingEditor Tariq Malik and Staff Writer Clara Moskowitz based in New York. Click here for shuttlemission updates and a link to NASA TV.